I picked up this Keltek PMR-30 today. 30 rounds of gold dot .22 mag. Shoots extremely accurate and the trigger is WAY better than I expected. Mount a weapon light under it to become my new armadillo and varmint killer at home and at the farm. What guns/gear did you get today? They were insanely priced for years. Now at MSRP and lower as production met demand. One of the gun rags recently called it the deadliest hand gun in the world because of the round count and the new bullets made by Speer with Gold Dot HP’s designed to perform at pistol caliber velocities. Zero recoil helped in that decision as well I suspect. You can shoot a whole string of Steel Challenge without reloading! Only if you don't miss, and come on man, it's Dennis we're talking about here. Better bring a spare mag. ive always wondered about the Keltec PMR. Safe to say you’re happy with the acquisition? Need I bring up some practiscore results? I know I’m half blind, old and decrepit, probably mostly senile although I can’t remember if I am or not, but I have whupped you at more than one match. So far very happy. In the first mag, I had one FTF. I didn’t do a real thorough inspection right after it was bought because the person I bought it from has a stellar reputation for maintaining his firearms. He cleaned this one up and left it unlubed before the sale so I could see it all. In my interest to shoot it asap, overlooked lubing it. Now, that confession out of the way, after disassembly and a good lube, 200 rounds down the pipe with 100% reliability. Dang trigger is really good for a cheap pistol. For the record, I also have a AMT .22 automag. In .22 magnum as well. Nothing but problems with the recoil impulse of the .22 mag causing issues with feeding a short barreled action. AMT did 4 or so versions with attempts to resolve the issue with the last being a stipple in the chamber to retard the recoil just long enough to generate pressure for the blow back action. Nothing worked, and they folded. What ever Keltek did on the PMR-30 works. I’ll do some chrony velocity reports when I get home from the lake. 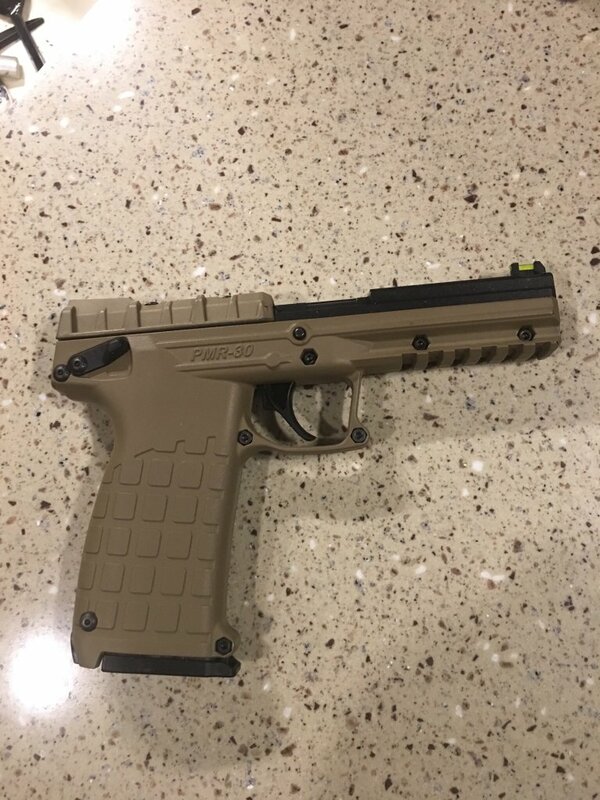 BTW, this is not my pistol thread. It’s an open thread for what did our members get that is gun related today? Be it gear or guns. Geezers of the world unite!! And I've whooped you at more than 2 matches. Geezer. I got a couple more .22 mags for the AR and a new rifle bag. Got 1k rounds of hollow point bullets to load for the 9mm 2 days ago. I ordered a new gun belt, but don't have it yet. I enrolled in the RO class that Cary put together for August! I booked a hotel for USPSA Nationals, just need a flight out there now. And I’m going to look at a holster today for the G19 I won in the BoomerShooter Contingency. When you get your new holster, lets see a review. I decided to buy a Shadow 2. Does that count? Bought a new open gun. Now just waiting on them to finish building it and ship it. I don't think you will be disappointed. I shot my brothers Shadow 2 and it handled very well. First I thought it was maybe his ammo, but then I realized I used my mag I had ready for my Shadow. I like to think I'll get one down the road sometime. Description? Inquiring minds want to know. Build by Freedom gun works. All black 2011 with a red trigger. C-more red dot sight. FGW comp. 38 super comp calibre. The guy building it called it a "Johnny Cash" gun. I am excited to get my hands on it. Hopefully it will be done by early July. With quitting my job and starting my own company this spring, gat purchases are on pause. But I did win at least one Glock, maybe a second his past weekend at Park City GSSF.